Born in Trani, Italy, in 1892 and brought up in Rome, producer Filippo Del Giudice trained as a lawyer and worked for the Vatican. In 1933 he fled fascist Italy for England and entered films four years later when, with Mario Zampi , he founded Two Cities . Early successes included the 1939 film version of Terence Rattigan 's play French without Tears (d. Anthony Asquith) and one of the first anti-Nazi films of the war, Freedom Radio (d. Asquith, 1940). But both Del Giudice and Zampi were nonetheless interned as enemy aliens in 1940. Del Giudice managed to negotiate his early release and relaunched Two Cities with the production of Noël Coward 's In Which We Serve (d. Coward/David Lean, 1943). Its spectacular success paved the way for some of the most ambitious British films to be made during the war. 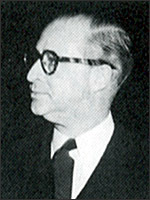 Del Giudice considered himself to be an "administrator of talents" rather than a producer. His prestige productions tended to be built around well-known directors, writers or actors, who would be granted an exceptional degree of creative autonomy. For a while this policy made Two Cities the most exciting film company in Britain, but soon cost it its independence. In 1944, to raise the finance for Laurence Olivier 's risky and very expensive production of Henry V (1944), Del Giudice surrendered a controlling interest to the Rank Organisation . Some great successes followed, including The Way to the Stars (1945), Odd Man Out (1947) and Hamlet (d. Olivier, 1948), but there were also some expensive failures, notably Men of Two Worlds (d. Thorold Dickinson, 1946). As costs mounted, Rank sought to impose increasing control over Two Cities . Unhappy with these restrictions, Del Giudice resigned in 1947 to form a new company, Pilgrim Pictures . Three films were made - the Boulting Brothers ' The Guinea Pig (1948), Chance of a Lifetime (d. Bernard Miles, 1950) and Private Angelo (d. Peter Ustinov, 1949) - but they were not box-office successes and Del Giudice struggled to raise finance. He returned to Italy in 1950, and, although he made some comeback attempts, never produced another film. He died in Florence on New Year's Eve, 1962.